A healthy employee is a happy employee. Did you know that each year we have Wellness Challenges for our employees to keep track of their personal health? These challenges involve tracking your healthy and unhealthy habits, reducing stress, or simply encouraging you to move around more. Last year at our annual employee barbeque our President and CEO, Michael J. Dowling, awarded prizes to the challenge winners who were all secretly hoping to win the grand prize, a trip to any one of our seven destination options, ranging from Peru to China to Thailand. Last year alone, Mr. Dowling handed out 14 prizes to employees who completed all 3 challenges. 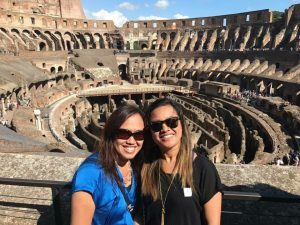 One winner, Imee Sarmiento, recently took her trip to Rome with her husband. 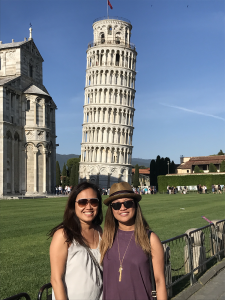 Wanting to get in on the fun, Imee’s sister Lulette (who also works for the health system) decided to plan a trip at the same time. Throughout their trip, they got to visit many famous cities such as Florence and Siena, but one sight they didn’t expect to see under the Tuscan sun was former United States President Barak Obama and the Air Force One Leaving the Rome Airport. “Winning this trip was an incredible experience! It was an enticing incentive for employees to promote health and wellness as well as encourage camaraderie amongst its employees,” said Imee. These sisters have been a part of our nursing family for 14 and 20 years respectively. “We don’t really know any company that granted their employees any wellness challenges and incentives such as the experience we just had. It’s amazing and totally reinforced Northwell Health’s dedication to be a forefront in leading and promoting employee satisfaction,” said Lulette. Here at Northwell Health, we are always looking out for the health of our employees. Our wellness initiatives not only allow our employees to maintain their health outside the workplace, but while working as well. Over the past few years, we have continued to put the health of our employees first by providing healthy food options at the cafeterias throughout our facilities and snack options in our vending machines. So far these challenges have helped hundreds of employees lose weight and change their lifestyle. We’re made for taking on challenges with innovative solutions. More than coworkers – friends who were made for each other.